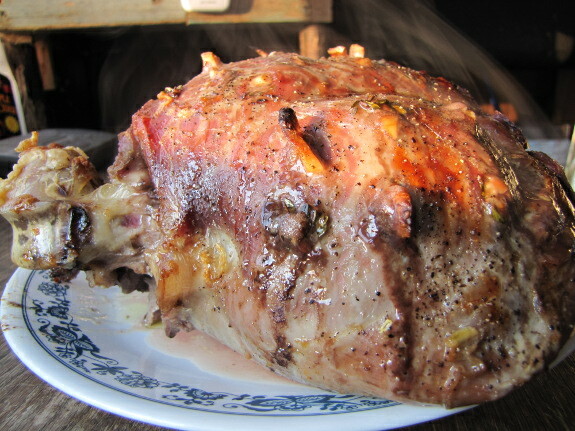 While Joey was smoking one venison ham, I was roasting another. 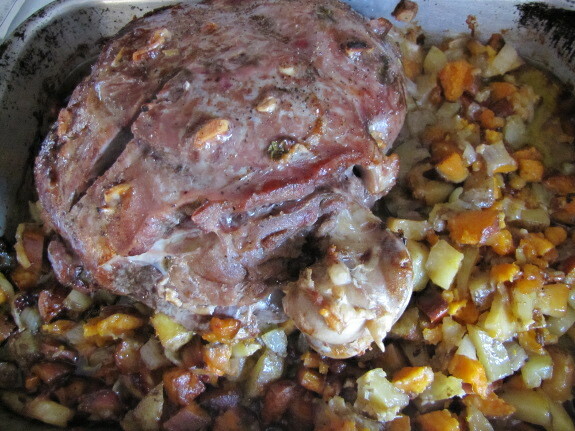 I had used this same recipe on a leg of lamb with outstanding results, and the venison was nearly as tasty, although tasting a bit more like roast beef and just barely requiring a knife rather than just a fork for cutting. If it's been frozen, first thaw your venison ham out thoroughly. Then slice up three big garlic cloves into slivers and pick a couple of tablespoons of fresh thyme sprigs out of your garden. Cut small slices into the ham and insert a piece of garlic and thyme in each slice. 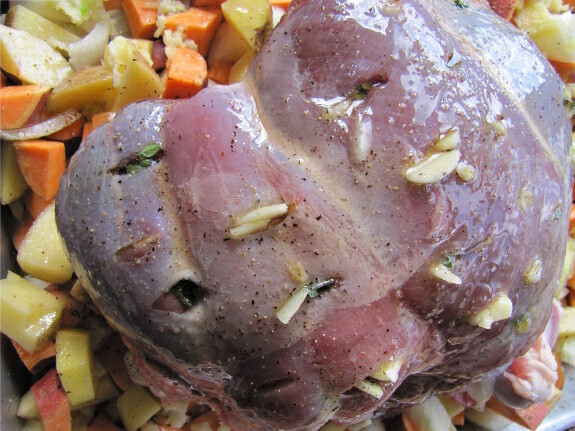 For best results, let the ham sit for a couple of hours before cooking so the flavors of the herbs can soak into the meat. Cut up a bunch of root vegetables to go in the pan, tossed with a bit of olive oil, salt, and pepper. My favorite combination is two onions, one large sweet potato, and two medium potatoes, with six cloves of garlic pressed over them. But you can mix and match whatever root vegetables you like best. Put the roast on top of the roots. Brush some olive oil on the meat and sprinkle a bit of salt and pepper on top. Bake at 425 degrees Fahrenheit for about half an hour to seal the juices inside, then turn down the heat to 325 and roast for at least two more hours. I got hungry and pulled it out when the meat was still medium-rare, so next time I think I'll allot at least three hours at 325 for a nearly 5 pound ham like this. You can eat roast venison ham plain or on sandwiches. Five pounds is a lot of meat for two people, so I ended up cooking the second half of it up into a pot of chili. 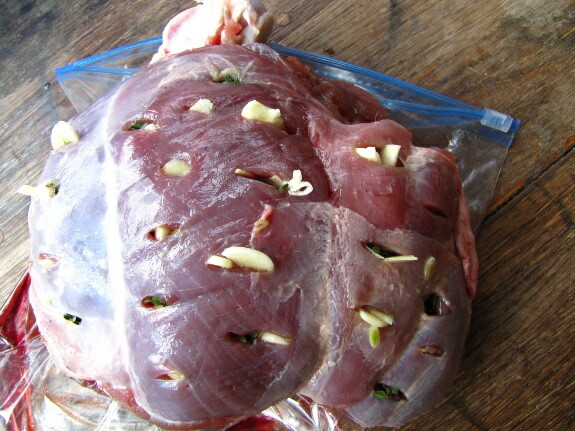 What's your favorite recipe for cooking with venison? Do you make outstanding venison jerky, awesome venison sausage, or something entirely different? I hope you'll post with a comment --- we've got a lot more meat to experiment with! Our chicken waterer makes care of the flock simple, clean, and fun.